If you are looking for a wedding card then the chances are you will be still finding the same old boring images of hearts, churches, the happy couple, flowers, horses and carriages etc etc . Seriously some of these card manufacturers seem stuck in the middle ages and simply don't grasp the fact that modern brides want something altogether more contemporary. When it comes to sending a greeting to a bride that is very modern you cannot beat business ecards. They boast real images which look awesome, your own message to personalise it and they are sent via email so they arrive instantly. Any bride will be overjoyed to receive this ecard but somebody who is getting married at work will really appreciate the gesture that you have sent them a private greeting as opposed to just adding your name to the office ecards along with everyone else. 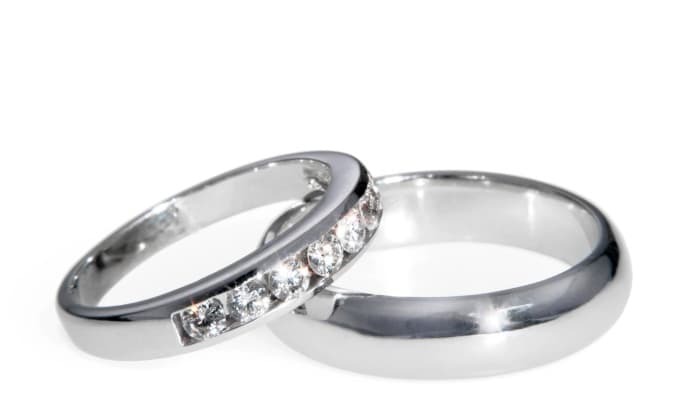 Two beautiful platinum wedding rings sitting together with a plain white background. The diamond encrusted brides ring is lying across her new husbands ring as if drawing strength from it. These are beautiful ecards that are beautiful in their simplicity and as it is sent electronically it will still look as good in times to come when those traditional cards are battered and faded. Sending corporate Christmas ecards to your employees and clients is a must this coming Christmas time so be sure to see what we can offer.